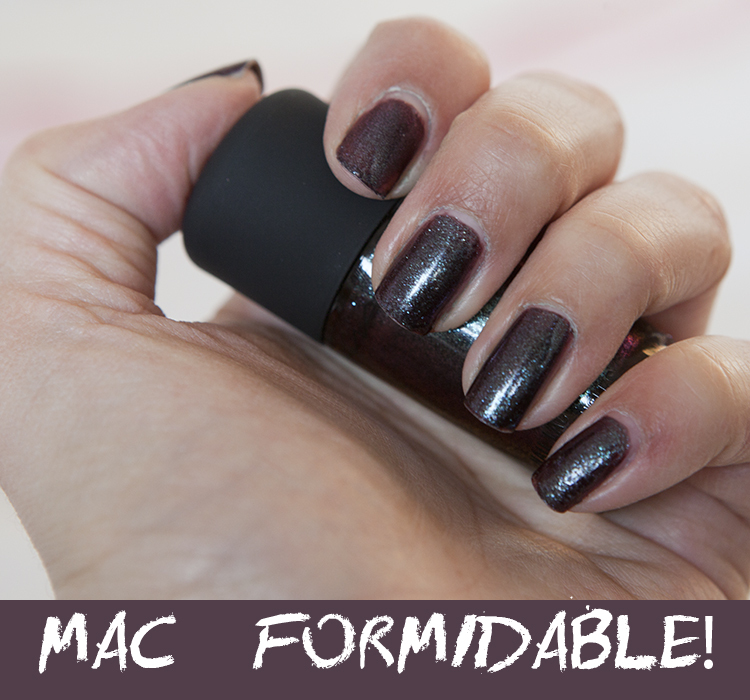 Nails of the Day - MAC Formidable! After my Venomous Villains collection arrived, I happened to be going passed a MAC store, only to see they had the full range in stock! I'd seen lots of swatch pics of the nail polishes and had thought I loved Formidable! It was out of stock when I placed the rest of my order online so forgot about it until then. When I'd seen it online it had looked to me like it had a petrol kind of effect - multi coloured, blacks, oranges, purples, aquas depending on the light and angle it was looked at from. In real life, well on me, it's nothing like that. It's a deep plum colour with glitter and an aqua pearl to it. I'm particularly fussy about anything that isn't a totally flat colour and this has left me completely underwhelmed. It does look different in different lights and is multi-tonal but not in the way I was hoping. If anyone would like to buy this from me for £8 + £1 p+p please let me know in the comments - I don't think I'll be using it again but know that it's out of stock.